Market-shifted technological innovation and clean energy policies are driving a fundamental transformation of the U.S. power sector. Yet the grid is largely governed by a decades-old legal framework. New regulatory and market design strategies are necessary to align the power sector with environmental goals while ensuring affordable and reliable service. That challenge is the focus of Power Shift, a network of energy law professors and energy practitioners, hosted by the Harvard Environmental and Energy Law Program, Duke University’s Nicholas Institute for Environmental Policy Solutions, and the Center for Climate, Energy, Environment, and Economics at the University of North Carolina Law School. Since 2015, the group has convened in conjunction with meetings of the National Association of Regulatory Utility Commissioners to discuss grid changes, to pose related legal questions, and to foster a research agenda for power policy reform. The first regional meeting of Power Shift took place in Minneapolis, Minnesota, in December 2017. 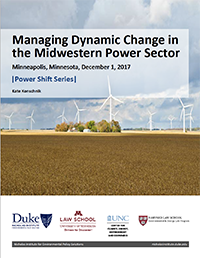 Participants discussed four critical grid issues in the Midwest: evolving stakeholder processes, power sector fleet transfer, the impact of electric cars on the grid, and responses to changing consumer demand. The range of potential research inspired by their discussion—including whether state regulatory processes help or hinder big shifts underway on the grid, how state climate goals affect regional generation patterns, how stakeholder processes and market trends interact, whether utilities should attempt to spark demand for electric vehicles, and whether customer demands or public policies are the driving force for change—points to the sea change in the U.S. power sector.